After years as a performing musician, producer, studio client, intern, assistant engineer, and engineer, I’d like to share my two cents on the purpose of engineer, and what constitutes a great engineer. I can distinctly recall a shocking moment during my very first internship in a recording studio. I was cleaning up a session from the previous night where a client spilled all sorts of drinks on a hardwood floor. The surface was so sticky that my shoes were difficult to lift. I began to mop up the mess, and before I knew it, the senior engineer was yelling at me in an uproar: “You’re doing it wrong, mop with the grain of the wood!” At the time, I legitimately thought the guy was psycho for becoming so angry over how I was mopping. I couldn’t have been more wrong. I was mopping against the grain of the wood, and therefore, inefficiently. The lesson I learned is if something can be done better, do it. As an engineer, the right way is always the most efficient way, and that is why I deserved a tongue lashing, even for what seemed to be minor error. 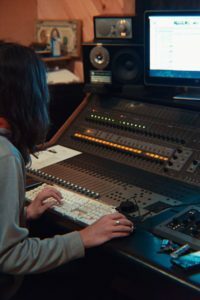 Even the most experienced engineers strive to improve their methods, and this goes beyond the technicalities of recording, mixing, and mastering – or mopping a studio floor. Maintaining a mindset of improvement is a way of life – extending to any circumstances an engineer may experience on a daily basis. At face value, the studio’s engineer operates all machines of the production process. The engineer is an expert on how they work and putting them to work, individually and collectively. The engineer ensures the final product, the record, possesses optimal sound quality for applications in the industry of consumers. 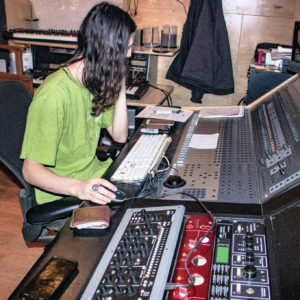 While all of this is true, I find the formal description of the studio engineer as incomplete. The formal description is missing the philosophical ramifications of an engineer’s purpose. In particular, the role of the studio aside from completing a project, and the timeless quality a great engineer can instill in a record. One truth to working in a recording studio is you never know who or what is going to attend a session. Clients come from all walks of life, and consequently, with all varieties of music. Working at Studio 11, I have serviced clients speaking foreign languages, clients dressed in sparkling costumes, celebrities, gangbangers, clients who are engineers like me, clients who have made me pray with them before the session starts, professional musicians, the musically inexperienced, and even a blind client – just to name a few examples. Being a recording engineer is a task demanding social skills, plain and simple. Any given person must find comfort in the studio – with the engineer as the host. At the end of the day, the engineer must host a meaningful, musical experience for all clients on the schedule. I believe an ideal studio session entails the client leaving with a quality record, and also as a better creator than when he first walked in the studio. The recording studio is a musical instrument. While the engineer is the expert at playing this musical instrument, involving the client must be encouraged. The mood, vibe, and communication of a studio session leave an imprint on any client’s satisfaction with a record. Ultimately, I believe a comfortable, creative atmosphere is necessary for studio sessions, and a good engineer will respect the creative styles of all clients. Input and opinion matters, and it matters how these viewpoints are communicated. In a nutshell, the creative direction of a studio session is decided by the client, not the engineer. Nevertheless, the engineer directly manipulates the studio, operating its machines, and making it happen. Surely, there are creative elements of a record where influence from the client is usually absent, or trusted in the engineer’s decisions. Overall, the engineer is the most trusted creator of proper sound quality and using the studio efficiently. Moreover, I believe another duty is equally expected: engineers must also do all they can to bless a record with timelessness. Timelessness in music is a quality possessed by Beethoven to Pink Floyd to Snoop Dogg. The timeless characteristic may be a combination of originality, authenticity, and uniqueness. What I can confidently state is the studio session plays a major role in timelessness happening or not happening. My most effective approach toward giving clients a timeless record is treating the recording as an artifact. It’s not just an mp3 or wav. file upon leaving the studio doors, but also the most accurate document of a performance that will ever exist. Identifying the grassroots of musical ideas is also important to a mental note on. Such knowledge translates into decisions made by the engineer, consciously or subconsciously. I am hesitant to claim any piece of music is completely original, which is why acknowledging music from the past is crucial for realizing the artistic medium of recording. Knowing what came before is instrumental in building the foundation of a record; from then on, the sky’s the limit regarding creativity. Surely, the sonic foundation for the creative music must be there, though. Lastly, I must touch back on reality, in that, at times, the engineering process steers away from my utopian description of the effective studio session. Speedbumps and challenges inevitably surface. The job may be hard, but it’s a job we are lucky to have. When things do steer away, the right decision is finding a solution, never resorting to an excuse. It’s what great engineers do. Excellent post. I was cecking conbstantly this blog and I’m inspired! Veery helpful info specialkly the closing part 🙂 I handle such information a lot. I used to be seeking this particular nformation for a very longg time.